Thursday wasn’t just an ordinary day at the Nevada State Athletic Commission’s meeting. The room was jam-packed full of media members and UFC officials eagerly awaiting the committee’s stance on issuing therapeutic-use exemptions (TUE) for testosterone replacement therapy (TRT). After much deliberation, Skip Avansino suggested to banish TUEs for TRT in the state. The motioned was quickly seconded. After several minutes, the NSAC voted unanimously to ban TRT in combat sports – effective immediately. The all-out injunction affects not only future fighters seeking TRT exemptions, but also extends to current users and past athletes who previously received permission to use TRT. The NSAC said it hoped other state commissions would follow their lead by also banning TUEs for TRT. For out-of-country UFC shows where no athletic commission is present, the UFC oversees the event. Because MMA organizations and athletic commissions (except Nevada) don’t conduct random, out-of-competition exams, there’s no way to police TRT use – or any performance-enhancing substances, for that matter. UFC president Dana White, who has gone back-and-forth on his stance regarding TRT, previously said the promotion will follow whatever rules the NSAC does. Speaking of White, in a text message to ESPN.com’s Brett Okamoto, White expressed jubilation immediately after the commission’s decision was rendered. “It’s a great day in the sport! I applaud NSAC. TRT needed to go away,” White stated. 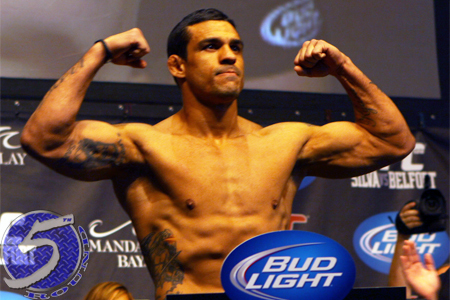 White might claim to be thrilled with the ruling, but the ground-breaking ban of TRT puts a big question mark over UFC 173 when Vitor Belfort (pictured), MMA’s most targeted TRT user, challenges middleweight champion Chris Weidman for his title. Prior to today’s ruling, Belfort and White didn’t believe there would be an issue with him getting a TUE for TRT from the NSAC for the May 24 scrap, despite the fact “The Phenom” tested positive for elevated levels of testosterone in Nevada in 2006. Belfort, Dan Henderson, Chael Sonnen, Antonio “Bigfoot” Silva, Frank Mir, Ben Rothwell, Nate Marquardt and Todd Duffee are current UFC fights known to be on TRT.